Yet, his childlessness was not for lack of trying, and the King married two times. His first wife was Marie Louise of Orléans, the daughter of Philippe, Duke of Orléans, the younger brother of Louis XIV of France and his first wife, Henrietta Anne of England. She was born on 26 March 1662 in Paris. 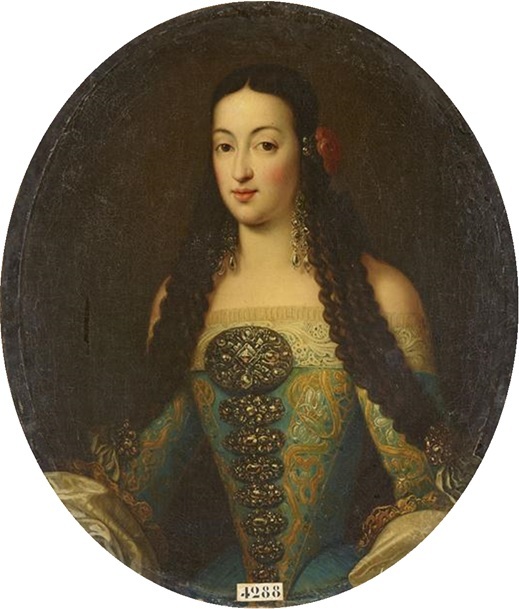 She had lost her mother when she was just eight years, and her father had remarried to Elizabeth Charlotte of the Palatinate the following year. Marie Louise herself was said to be deeply in love with her cousin the Dauphin, but fate had other plans for her. When told she was to marry the King of Spain with his “monstrous jaw”, she cried to her father and her uncle to save her from such a fate. She appealed on her knees to them to let her stay in France, only to be coldly reminded that her duty was to France. On 30 August 1679, she was led into the principal saloon at Fontainebleau with the King on one side and the Dauphin on the other to be formally betrothed to the King of Spain. Her seven-yards-long train was of cloth of gold and borne by Princesses of the Blood. The proxy wedding took place the following day with the Prince of Conti standing in for the King. On 20 September 1679, the new Queen began her journey south to meet her new husband. She had resigned herself to this marriage and was mute along the way. Her excited new husband could not contain himself and headed north before Marie Louise was even in Spain. M. Villars had started to join the King, who is going in search of the Queen with such impetuosity that it is impossible to follow him. If she has not arrived at Burgos when he reaches there, he is determined to take the Archbishop of Burgos and go as far as Vittoria, or to the frontier, if needs be, to marry the Princess. He was deaf to all advice to the contrary, he is so completely transported with love and impatience. So with these dispositions, no doubt the young Queen will be happy. The Queen Dowager is very good and very reasonable, and passionately desires that she (Marie Louise) should be contented. If I were ruled by the impulses of my heart alone, I should be sending off couriers to your Majesty every instant. I send to you now Sergeant Cicinetti whom I knew at the Court of France, and his great fidelity also to your Majesty’s service. I pray you receive him with the same kindness that I send him. My heart, sire, is so overflowing with gratitude that your Majesty will see it in all the acts of my life. They wished to make me believe that your Majesty disapproved of my riding on horseback but Remille (? ), who has just come from your Majesty assures me that just the contrary is the case, especially as for these bad roads horses are the best. As my greatest anxiety is to please your Majesty, I will do as you wish; for my whole happiness is that your Majesty should be assured that I shall only like that which you like. God grant you many years of life, as I desire and need. When they finally met, Marie Louise went to kneel and kiss the King’s hands, but he stepped forward and raised her up. She was wearing “a beautiful French costume covered with a surprising quantity of gems.” They exchanged some words in Spanish but soon found that Charles’s mumbling speech and Marie Louise’s less than fluent Spanish made it impossible to communicate until an interpreter was found in the form of the ambassador. That same day they married in person without much pomp. From then on, Marie Louise dressed in the Spanish fashion as Charles preferred it. Her first meeting with the Queen Dowager Mariana was friendly. She has grown so fat, that if it goes much further, her face will be round. Her bosom, strictly speaking, is already too full; although it is one of the most beautiful I have ever seen. She usually sleeps ten or twelve hours and eats meat four times a day. It is true that her breakfast and her luncheon (collation) are her best meals. She always has served for lunch a capon boiled and broth, and a roast capon. She laughs very much when I have the honour to be with her. I am quite sure that it not I who am sufficiently agreeable to put her into such a good humour and that she must be pretty comfortable generally. No one could behave better than she does, or be sweet and more complaisant with the King. She saw his portrait before she married him, but they did not paint his strange humour, nor his love of solitude. The customs of the country have not all been turned upside down to make them more agreeable for her, but the Queen-Mother does everything she can do to soften them. 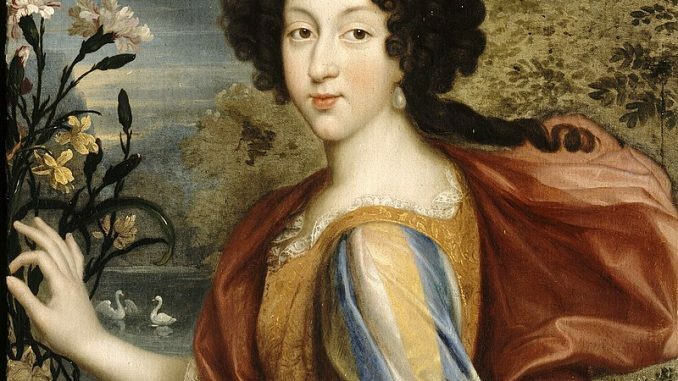 By 1687, Marie Louise was “lately ill with fever, owing to the rubbish she is always eating Nobody can control her, and she looks consumptive. Those of us who are not much attached to her are not sorry to see her afflicted.” She was still only 25 years old, but she was already losing her beauty and her health. Despite her health concerns, pregnancy rumours continued to come, and the hopes of the French were raised. In the autumn of 1688, Marie Louise fell ill with smallpox. She was a bad patient, and Charles fearfully stayed away. In reality, Marie Louise had very little to live for. Her husband was feeble-minded, they had no children, she was not allowed to keep French ladies about her, and she had no political influence. She was losing the will to live.